Featured on the cover of Author Lanie Tiffenbach’s new book “Threads of the Past” is a quilt that I quilted for her. This quilt was also featured on the cover of April, 2011 issue of American Patch Work & Quilting Magazine and won Best Long-Arm Quilting and Best of Category Awards at the ACQ 2012 Quilt Show. The book is available for purchase on Amazon. 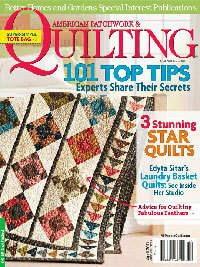 Follow the Leader is on the cover of Better Homes & Gardens American Patchwork & Quilting April, 2011 available now. The quilt was designed and pieced by Lanie Tiffenbach and custom quilted by me.